The Joint Center for Housing Studies of Harvard University released the 2015 edition of The State of the Nation’s Housing report this week and it wasn’t pretty. The report basically highlighted the fact that the homeownership rate has dropped to the lowest level in recent history, while renting has simultaneously surged. Last year, the U.S. homeownership rate fell to 64.5%, which essentially erases all of the gains realized over the past two decades. We’ve basically returned to 1993 levels, as seen in the chart below. It has since continued to fall, dipping to 63.7% during the first quarter of 2015. Harvard noted that the fallout has been widespread, with all generations affected, especially generation X (born 1965-1984). Put simply, young gen-Xers picked a terrible time to be born, succeed financially, and then buy their first home. Because as we all know, home prices were grossly inflated about 10 years ago, and have yet to recover after falling back down to Earth. 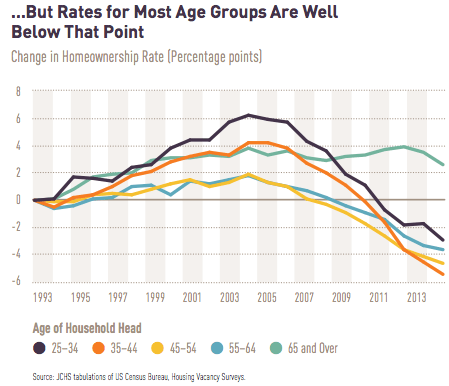 In fact, homeownership rates among those aged 35-44 and 45-54 have suffered the most, and now stand at rates 4-5% below those seen 20 years ago. The only group that hasn’t really seen a major hit is the 65 and over cohort, which despite a recent dip, has a homeownership that remains about 2% above 1993 levels. What’s the Rental Market Like? 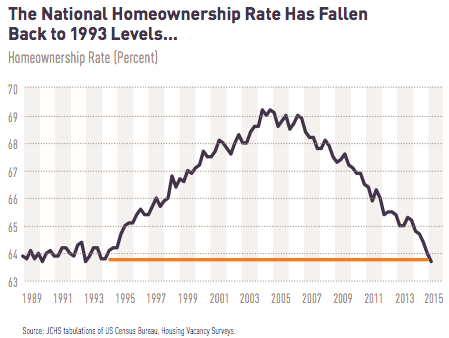 If there are far fewer homeowners, there must be a lot more renters, right? Right. From 2004 to 2013, renter household growth has averaged 770,000 annually, making it the best 10-year period for renter growth since the late 1980s. During this period, 3.2 million single-family detached homes made their way into the rental market to accommodate demand. Developers have also added 1.2 million apartment starts since 2010. Despite this, the national vacancy rate fell to 7.6% in 2014, the lowest point in nearly two decades. The result has been steadily increasing rents, which rose 3.2% last year, twice the pace of inflation. The problem is that the little more than one million housing units started last year was still close to the lowest total in the past half-century. So while it sounds like a lot of new supply, it’s not enough to keep up with demand, especially as household growth seems to be in an uptrend. Part of this can be attributed to Millennials growing up and making the move out of mom and dad’s house. Wage growth also contributes to that trend. Unfortunately, there aren’t many entry-level homes available for purchase because a lot of the current owners are underwater or lack the equity to sell and use the proceeds (for down payment) to buy up. Turnover is also going to be limited as baby boomers age and hunker down in their existing properties for the next decade. However, 2025 may be a turning point as the oldest band of that population ages and has more trouble living independently. Still, it doesn’t solve the problem now, which is unaffordable rent and a lack of housing inventory. Harvard seems to be cautiously optimistic (at best) in their outlook, calling on looser mortgage lending to help more renters transition to homeownership. Ironically, we might be in a situation that calls for creative financing, such as an increased reliance on ARMs (especially as mortgage rates rise) and more 97% LTV lending. Rates will need to rise as the economy improves, which is generally okay as long as wages also increase. This shouldn’t dampen home prices either because a good economy goes a long way. Harvard believes the housing recovery may continue this year, but only if employment growth lifts household incomes that are clearly lacking. There’s a general belief that renters have a willingness to own, but they question whether renters have the means. As mentioned earlier this week, owning a home requires $10,000 outside the mortgage. The report pointed out recent moves by Fannie, Freddie and the FHA, including lower down payment and credit score requirements, but questioned whether such changes would be meaningful. In the meantime, renters are stuck between a rock and a hard place, with rents becoming unaffordable and homeownership unattainable. It’s become so ridiculous that unaffordable rent may be the sole reason to buy. But it’s hard to save money for a down payment when you’re barely getting by. Harvard ultimately believes the goal should be affordable housing for all, though they don’t seem to offer any solution to that problem. It’s getting hard and harder for people to get their hands on a mortgage. The underwriting process has become very tough even for people that can clearly afford their payments. Some would rather just deal with a landlord than the bank.